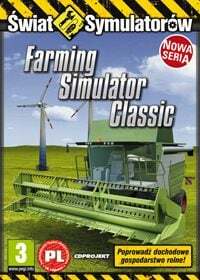 A simulation game allowing you to play the role of the owner of an agricultural holding. With the help of various machines, we cultivate different crops and then harvest them to sell them profitably. In Farming Simulator you are a farmer and will experience the versatile everyday life of a Farmer. Take a seat behind the steering wheel of the different detailed agricultural engines and carry out your work in the fields. You’ve got to plow your fields, sow the seeds, reap or station the harvest to store it in the silo or deliver it to the next harbour. The life of a farmer is hard, and so the player has to steer his heavy vehicles around the clock to earn his keep of life. As in the real world of farming the weather isn’t always on your side, and rain and hail give you a hard time. Additionally different missions have to be mastered, you also have the possibility to move absolutely free within this huge game world. Game score 8.1 / 10 calculated out of 189 players' votes.